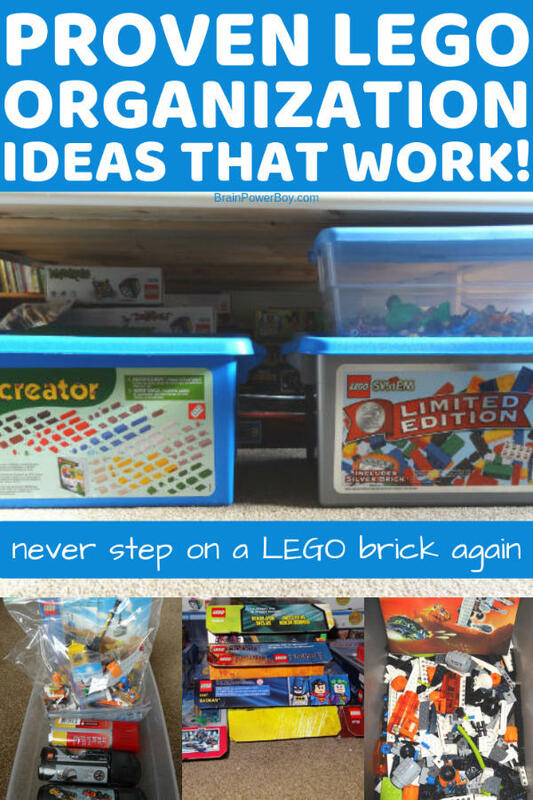 Proven LEGO Organization Ideas – Never Step On a LEGO Brick Again! I am a huge fan of LEGO and finding a way to live happily with it was important to me. I didn’t want bricks all over the house and I most certainly didn’t want to step on a LEGO brick! Ouch!! Today I’m sharing our LEGO organization and storage system. I wanted my son to have plenty of opportunities for play and I wanted to have things organized enough that we could find things. Getting organized isn’t that hard and it is totally worth the effort. Honestly, I have never stepped on a brick so that should tell you right there that this is a proven method! Here is our method of organizing LEGO bricks. We took some pictures so you could see what we do and hear how it works for us. This LEGO organization and storage method is based on many years of living with a lot of LEGO and we have it down to a science now. Bricks, bricks and more bricks! We have a lot of LEGO and had to find a way that would actually work when it came to organizing and storing it all. Of course, we would rather have the awesome space you see below for our LEGO but, hey, we don’t have a quarter of a million bricks yet and I can’t really afford to go all out like this guy did! We tried a few different things but not all of them worked well. Below is what ended up working the best for both me and my son. He has to be able to get to what he needs quickly and easily and be able to put things back where they go. You don’t want to create, or follow, a complicated, difficult system because then it won’t get used. 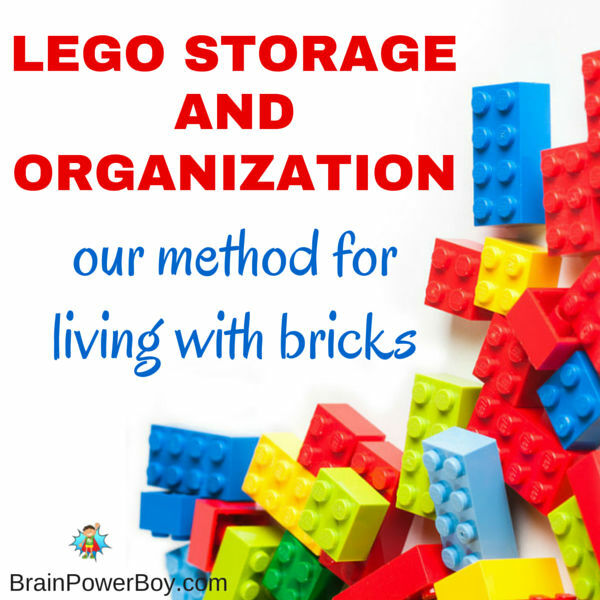 See our LEGO Storage and Organization Considerations article before you put something in place for your family. As you will see in that article I made a big mistake and we had to start over! Figure out how you plan to sort before you decide what organization idea will work for you. This was the number one best thing we did to organize our LEGO. We put it under the bed! It is so easy to find what you are looking for. 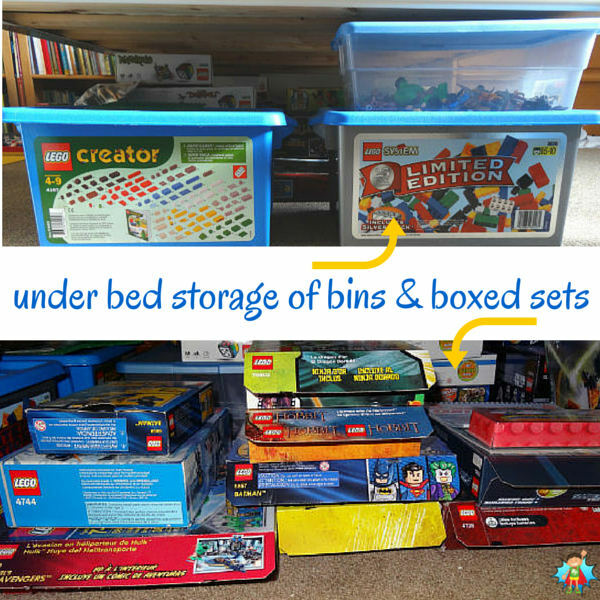 The bins with loose LEGO bricks and elements are at the foot of the bed as they are used the most. LEGO Plates are stored on top the LEGO Creator bin on the left. Plates are not in the storage area too often as they are almost always full of some type of creation or LEGO setup. Be sure you have plenty of plates to boost LEGO play. The sets are all organized by topic or by type of item. For example, all the Star Wars LEGO sets are together as are the LEGO games etc. This method makes it really easy to see where everything is and to put them back in the right place when you are done with them. If you don’t have a bed that comes up very far and can’t fit your sets underneath you could get these bed risers. They are an awesome way to make extra storage space at home. 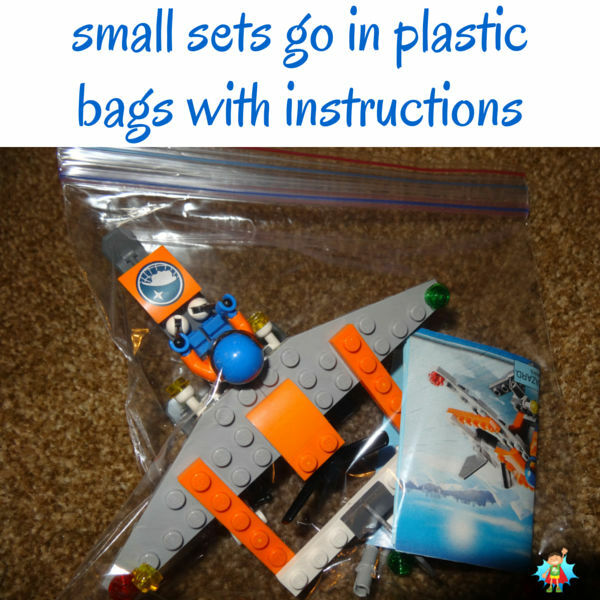 We put small LEGO sets into plastic ziplock bags because the small boxes don’t stay shut very good once opened and pieces kept sliding out. Each set has its own plastic bag and all of the pieces, as well as the instruction booklet, fits into it. Some of our small sets are in plastic containers. Examples include older LEGO Racers and LEGO Bionicle sets. Since they come in their own nice holders we just put everything back into there. 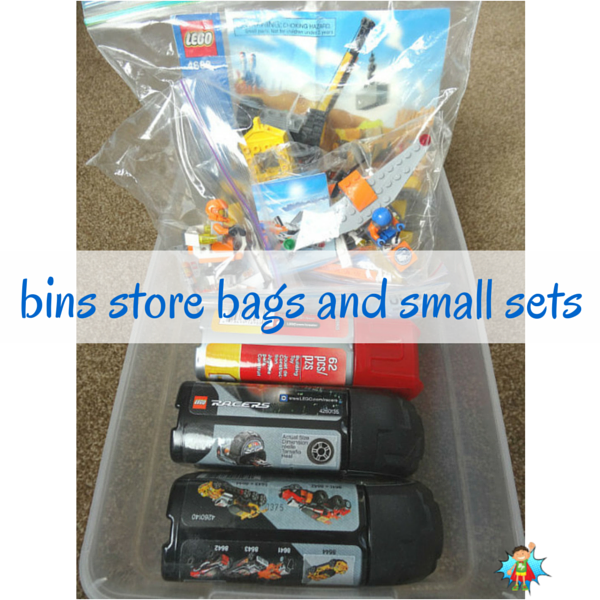 We have quite a few small sets so we decided to put them into shoebox size plastic bins. You can certainly use a regular shoebox or other box for this. I just like to use the clear bins because it makes it easier to find things. Some of the bins have covers and are stacked, some are open like the one you see below. Most of our large LEGO sets are in boxes under the bed. 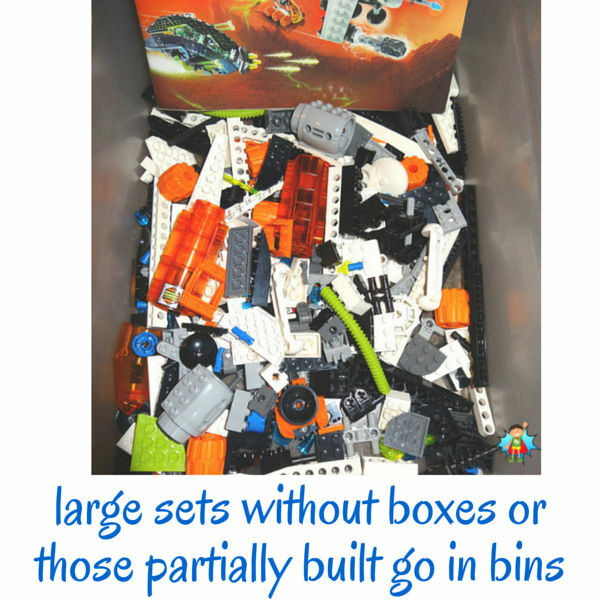 However, we have some sets that are stored in bins. The instructions and all pieces are kept together. We also have bins for sets in progress. When you are building a set you need a place to store it while you are working on it. Once a set is partially built it won’t fit back into the box. This works great as you can pick them up and move them to different areas of the house to work on the sets and it also keeps all of the pieces together so they don’t get misplaced. Minifigs! 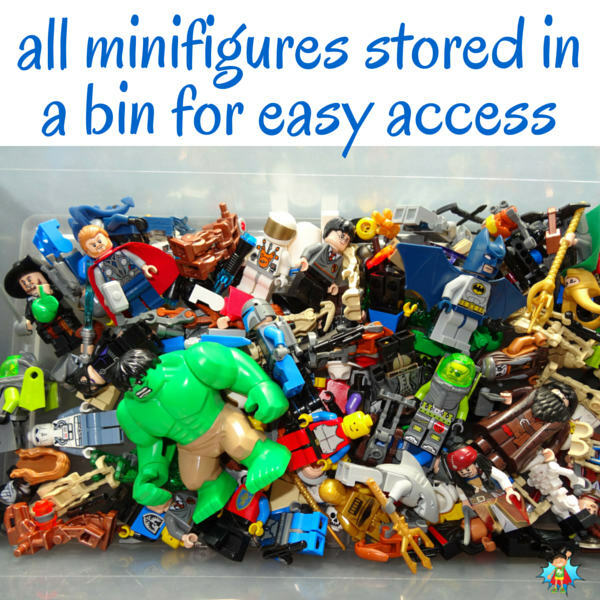 We tried a few different storage ideas with our LEGO minifigures and this is what we are doing right now. First we had all of the minifigures stored with their sets. Then we had some in the sets and the favorites stored with the bricks. Then we decided to give all LEGO minifigures their own bin. Minifigs get used a lot in our house and this seems to work really well. I hope you enjoyed a peak into our LEGO storage methods. It really did take a few years of switching things around and trying different things for us to find a method that works perfectly for us.